Pipe End Facing Machines ..
Cuts precision bevels on thin or heavy wall pipe ends to prepare the joint for welding. Hydraulically driven, it uses a positive gear driven feed in order to produce perfect bevels and or counter bores with any bevel arrangement. Machine counter bores or transition tapers to join pipes of different. » When expanded. The shoes lock the machine into the pipe and bring the pipe into roundness for the beveling process. » Consists of a gear driven cutter wheel with three major tool holders attached ( a tool following wheel, a tool assembly and a tool actuating spring). » Rotary cutting head is moved towards the pipe to create an accurate bevel. 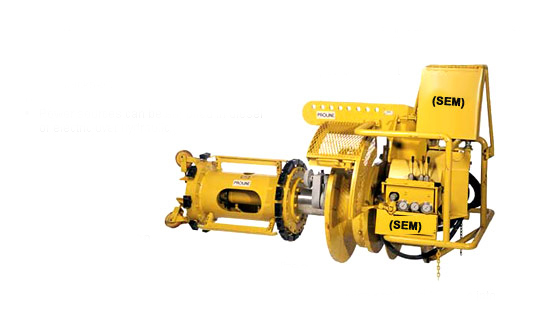 » A hydraulic motor rotates the cutting head via a pinion and ring gear. hydraulic to run the end preparation machine.